Used to measure longitudinal depth dimensions. 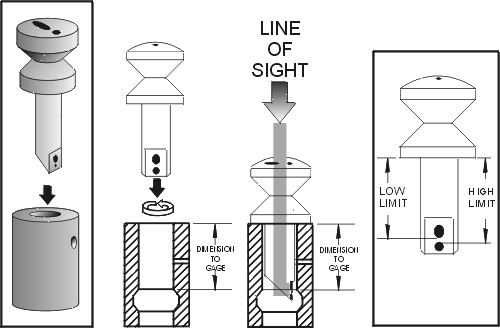 SIGHT-PIPE DEPTH GAGES provide a practical method for visually inspecting hard to gage depth dimensions in machined bores or cavities. Each Depth Gage has a Gage Dot pattern for the tolerance of the specific application. 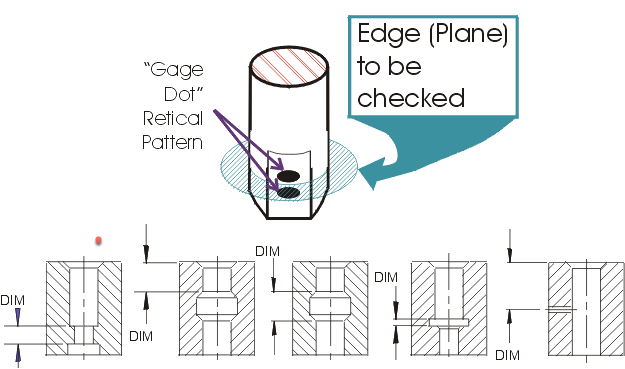 When the SIGHT-PIPE Depth Gage is inserted into the piece part, a magnified image of the two Gage Dots, and the edge of the characteristic being inspected is projected to the top of the enlarged head of the SIGHT-PIPE . The characteristic being inspected is in tolerance when it is viewed tangent to, or passing between, the Gage Dots. It would be out of tolerance if it was viewed as passing through either of the Gage Dots. The characteristic being inspected is in tolerance when it is viewed tangent to, or passing between, the Gage Dots. It would be out of tolerance if it was viewed as passing through either of the Gage Dots. – stocked SIGHT-PIPESÒ have custom Gage Dots added.